Heading off up the very steep steps that follow the course of the Nant Cadair river from the visitor center takes you up to around 400m and the split of the paths where you fork off to the left (the right hand path over the river is the path that I'd return on the next day after completing the circular trip of the Cadair Idris range. Its here that the Minffordd path really gets going in earnest and gives way to the rock studded, grassy slopes that make up the foothills of the Cadair Idris range. Following the path for another kilometer or so takes you up to the edge of the picturesque Llyn Cau which was to be my resting place for the night. It was 7:30pm and the weather was just starting to turn so finding a pitch for the tent became more of an urgency than a luxury of choice! However, there were already two other tents occupying the "best spots" so a bit more thought (and wandering around) was required to find an even pitch for my tent. It was wandering around the edge of the lake that I bumped into one of the other "Wild Campers", Felix, who suggested a spot on the North East side of the lake that was slightly too small for his tent but should fit my Marmot Grid nicely. It was during our chat I found out that Felix and his girlfriend had traveled up from Southampton and Winchester that morning - it really is a small world! So after setting up the tent (its worth pointing out here that this was the first time I'd pitched the Grid in a hurry, in fact anywhere but the garden, and the lesson learnt from today was that more time/care is needed to make sure all the guy ropes are tight and the sides are tensioned properly - otherwise its an amazing tent), taking a few pics and heating up my meal-in-a-bag of All Day Breakfast there wasn't much more left to do other than settle down and listen to the rain on the tent - oh, and wish that I'd inspected the "flat" bit of ground I'd selected for the tent a bit more closely as it was far from flat and with no roll-mat it was going to be an uncomfortable night! 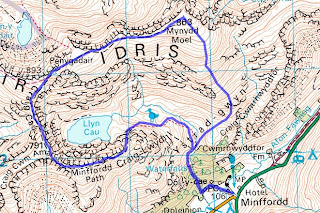 Sunday 28th August dawned clear and rain free which was a result after a night of heavy rain and blustery wind and I set off at about 7am, after a quick breakfast and striking camp, back on to the Minffordd Path to follow the line of Carins that studded the path along Craig Cau. 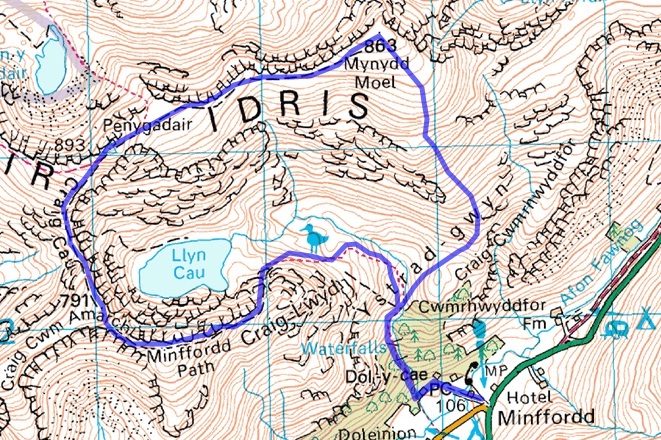 Its at about 760m that the path swings around to the right (NNE) for the last 700m or so up to the summit of Penygadair (or "Top of the Chair" if translated into English) at 893m. Now from the summit a bit of compass work is required (or GPS if you want to cheat!) as the Minffordd Path heads off at about 60 degrees (don't quote me on this, take the bearing yourself when you're up there!) and tracks off slightly to the right of the main Pony Path and follows a faint line of Cairns back around the ridge of Cadair Idris towards Mynydd Moel. Even with taking a compass bearing I managed to follow the main path and realised, when the ground either side of me turned into steep rockly flanks, that I'd gone slightly off course - I blame the heavy mist! 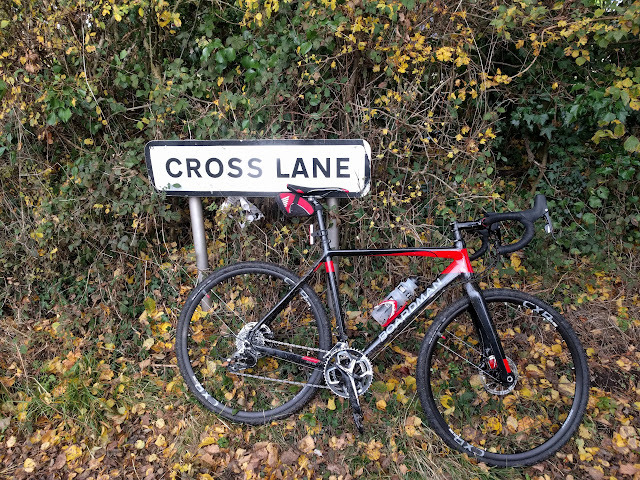 So out came the trusty Garmin for a sanity check. All in all this is a fantastic walk and the night of Wild Camping turns it from a 5 hour (ish) walk around the Cadair Idris range into a multi-day trip with everything you could want from a Welsh mountain walk; scenery, weather, views and sheep! Absolutely loving that final photograph. I'm going there next week, can't wait !! Also doing Camping near the lake. Thanks Ciwan, hope you had a good time on Cadair and the weather was kind to you! Is that really a relaxing break?